BlogRush just announced today that they're adding several new color variations to the BlogRush widget. 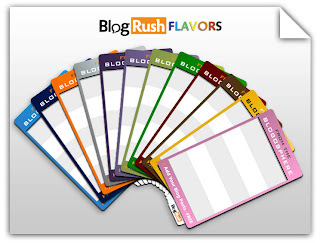 This addition is called "BlogRush Flavors" and it'll allow you to match your widget with the color scheme of your blog. That's definitely a great improvement that I like very much! I just wonder if John Reese and the rest of the BlogRush team have been eating a lot of Skittles lately?! 'Cause with BlogRush Flavors I know I can certainly taste the rainbow! BlogRush is also hard at work devising many new improvements that are all geared toward helping bloggers get more targeted traffic. In addition, BlugRush will also be adding a special bonus crediting system that'll give out certain bonuses to only the members who have low blog traffic since - they need the help the most. I really like that idea as well. It's a nice way to share the love and help lower-traffic blogs gain new readers. I think this works well for several reasons. It'll give those who don't get a ton of traffic a nice boost, which should really get them excited about blogging. And it'll also give the rest of BlogRush members an opportunity to discover new blogs that they might never have happed upon. This may very well help launch some unknown blogs into popularity. And as we all know, every popular blog once started out as an itty bitty baby blog with no readers at all! So far, I think BlogRush is doing a mighty fine job right out of the starting gate. And if they keep listening to the comments, concerns and suggestions from the BlogRush members, then I think they'll definitely become a staple in every blogger's diet. So if you haven't joined BlogRush yet, I suggest you hop on it! I'd go as far as saying it has to be the most successful widget ever launched. I mean in this short a period of time, it seems every blog has one already! Stumbled my friend! I am so excited they will have one in pink... I hope that we can change the size of the widget too. Otherwise no go for me. I got rid of my BlogCatalog widget.... weird, huh? Bobby: I totally agree. It's really taken a seemingly strong foothold really fast. And the BR team definitely seems to be on top of things. Let's just hope that they can keep it up! As for customizing the size of the widget, I'm pretty sure that option will be available soon. I already emailed them the suggestion and left it as a comment on their blog. And I see that quite a few bloggers are talking about the want for size customization, so I'm sure they'll hop on it as soon as possible. Btw, why did you get rid of your Blog Catalog widget? Just curious. No problem! I want you to be successful. I will do everything possible to help drive you and several others whom I think have what it takes. It is my goal to bring a fresh sense of what real power is into the limelight. Real power is power without ego which exudes an unmistakable sense of integrity. It seems like the big bloggers, once they are big, trim things from their blogs such as the friends they had before they were big! If I make it into that spotlight, you couldn't pay me enough money to remove my association with the friends I have. I would sooner die than ever have that happen. Alright, here goes. I ran across this blog from Tim Nash. I started reading it and it occured to me that he knows quite a bit about things. Check his blog out and tell me what you think about his skills in and understanding of seo. Thanks Bobby. I'll definitely head over there and read it. Btw, have you looked at Yuwie yet? I just got another sign up today. The guy left a comment in my Yuwie post letting me know he had signed up and that he found my site via BlogRush. :) Cool. I do not see blogrush as a long term thingy, as any mlm ever, will limit at a point. Similar things have been made in the past but haven`t the "big names" support and vanished. As short and average terms, only site of blogrush have a real win, with tousends of linkback (there is one in any wodget and at least 2-3 in each blog) and tons of traffic. And everybody promote it, as is heaven on earth, knowing that if no big downline, no good chances. Blogrush is just another traffic exchange web1.0-mlm style with a face of web2.0 . Hi Bobby. I read what he wrote about it, and aside from the fact that he's critiquing something that he hasn't even tried yet, one thing I'll point out is that there's obviously some confusion about what pyramid schemes and Ponzi schemes are. The blog he linked to is calling it a Ponzi scheme, but that's incorrect. A Ponzi scheme requires a monetary investment as dies a pyramid scheme. By definition, a Ponzi is a fraudulent investment operation that involves paying returns to investors out of the money raised from subsequent investors, rather than from the profits generated by any "real" business. It offers high short-term returns in order to entice new investors whose money is needed to fund payouts to earlier investors and to lure its victims into even bigger risks. Since there's no money exchanging hands, BR cannot be classified as a Ponzi or a as pyramid scheme as both require monetary investment up front. Yes, BR is pyramidical in structure, but it is neither a pyramid or a Ponzi. As for BR itself, I can't say whether or not it'll remain effective. So far it's brought me some decent traffic, but whether or not that will continue I can't say for sure. I have, however, discovered a few new blogs through it, so I think that's a plus! And I know it hasn't distracted me from reading the ones I normally read either. None the less, Tim's 2 blogs, espcially venture skills is very impressive. I joined the blog catalog stumble group. I highly recommend it. Under the group, in discussions, click stumble this (I think that's it) and stumble all the folks and they will stumble you and any posts you want. Thanks Bobby. I'll definitely join the Blog Catalog Stumble group. Sounds great. And I'll check out his other two blogs as well. All sounds like a winner to me!